Hello, friends, and welcome once again to Choose My Adventure. This week, our time with Trove is drawing to an end, but we’re not finished just yet. When we last met (a whole two weeks ago), I gave y’all the opportunity to vote on which class I should unlock with my hard-earned cubits to finish off this run. Though Tomb Raiser and Boomeranger — the two classes that were not available as starting choices — put up a valiant effort, pulling in 30% and 12% of the vote, respectively, it should come as a surprise to absolutely no one that the far-and-away winner of the contest was the Lunar Lancer, which pulled in a solid 58% of the total votes. The most recent addition to Trove’s already impressive roster of classes, the Lunar Lancer, was added to the game just last week, and I — like many of you, apparently — was quite eager to find out what new goodies it brings to the table. As fortune would have it, that’s exactly what I did. I have to admit that, after my stint as a Candy Barbarian, it took me quite some time to get settled into the Lunar Lancer’s playstyle. No longer could I simply wade through throngs of enemies, cutting them down with scything sweeps of my weapons as their blows bounced ineffectually off of my impenetrable armor. The Lunar Lancer isn’t exactly a brick wall and lacks the self-healing capabilities of the Candy Barbarian, so instead I was forced to fight with guile and precision. The Lancer’s weapon of choice, as you might have guessed, is a spear, and as such, its basic attacks can strike only straight ahead, much unlike the kill-everything-in-a-five-foot-radius attacks of the Barbarian. For the first time in quite a while, I found myself needing to actually aim my attacks with a modicum of care, rather than just holding down the button until everything is dead. The Lancer’s first ability likewise required considerably more finesse to use than what I’d become accustomed to. Said ability, simply (but accurately) called Throw, causes the Lancer to hurl his spear at an enemy. Using the ability a second time after the spear has landed sends a grappling hook to the spear’s location, pulling the Lancer toward it and dealing damage to any enemies in his path. The throw, however, has a considerable arc to its trajectory, so getting used to reliably hitting far-off targets without having to carefully line up the throw took some practice. Once I got the hang of it, though, it was a game-changer. Although neither the initial throw nor the follow-up grapple does too much in the way of damage, the absurd amount of mobility it provides more than makes up for that shortcoming. Energy management is a concern, of course, but judicious use of the ability’s grappling-hook function enables some fairly effective hit-and-run tactics for those situations where being fleet of foot is more important than raw power. Plus, I have to say it’s proven itself to be an incredibly value tool in getting around the game world, as well. That’s certainly not to say, however, that the Lunar Lancer can’t dish out some serious pain. His second ability, Crescent Combo, delivers two successive spear swipes in an arc in front of him. On top of dealing some pretty heavy damage with each hit, the combo’s second strike also stuns its victims for a short time, thereby adding a bit of crowd-control capability to the Lancer’s arsenal. Rounding out his repertoire is his ultimate ability, Blessing of the Moon, which calls down an orbital-strike spear (totally a thing) from the sky, dealing massive damage to any enemies in the spear’s impact zone while also providing a substantial buff to all allies in the vicinity. With his array of powerful and versatile abilities, the Lunar Lancer is a force to be reckoned with for sure, but what really gives him a sense of uniqueness — and a good chunk of his power — is his passive ability, Lunacy. With every successful attack, the Lancer has a chance to generate moon power. Once enough moon power has been accumulated, the Lancer transforms into his Lunatic mode, which is a vulpine, Silver-Samurai-esque monstrosity. This transformation not only provides him with a bunch of tasty buffs, but also alters the functions of his abilities. For instance, while the Lancer is transformed, the second hit of his Crescent Combo doesn’t just stun enemies, but knocks them sky-high, and his already hella powerful ultimate ability becomes utterly devastating thanks to the addition of dozens of mini-explosions that destroy monsters and terrain alike. So by the time I hit level 10 on my Lancer, I was breezing through dungeons effortlessly. Between the mobility afforded to me by my grappling spear and the raw power of my Crescent Combo and Blessing of the Moon, I felt like I was practically untouchable. In fact, the most dangerous foe I faced was simple elevation, as my spear strikes couldn’t touch enemies just slightly above or below my position. Still, that seemed to be a small compromise to make in exchange for a class that is not only incredibly versatile and effective, but also — in my opinion — flat-out stupidly fun to play. Also, I feel that it’s worth noting that, from an aesthetic point of view, I absolutely love the new spear weapons. Admittedly, it may have something to do with my quasi-obsession with using polearm weapons in MMOs (the jokes write themselves! ), but just about every spear I picked up — and I picked up a lot — looked pretty badass. Even the one that’s just a cactus flower on a stick, so I think that’s a pretty big accomplishment. 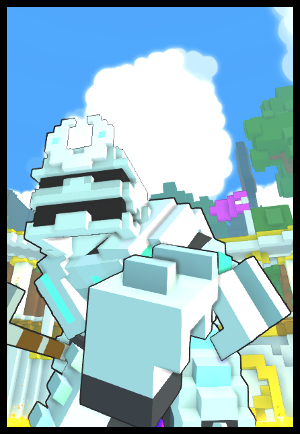 So there you have it, folks: my thoughts on Trove‘s latest class, the Lunar Lancer, and the end of yet another cycle of Choose My Adventure. Thank you all, as always, for joining me on this little adventure, and I hope you’ll stop by next week to vote on which game I should adventure in next. And of course, please do leave any suggestions in the comments. I’m always looking for new candidates! Now if you’ll excuse me, I have to go slam textbooks against my head until the information is absorbed into my mind. Until next week, friends. Welcome to Choose My Adventure, the column in which you join Matt each week as he journeys through mystical lands on fantastic adventures — and you get to decide his fate. Be gentle (or not)! I never seem to proc lunacy mode during boss fights. It’s always right after I hit that one monster just outside the dungeon on my way to the next. 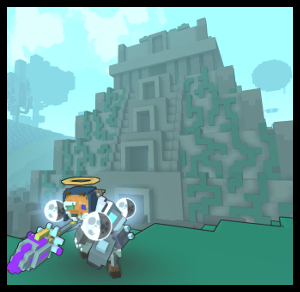 Nice write up.Trove sounds like it could be quite fun.